An opportunity to see and inspect up close quality prints in an original style of photography. 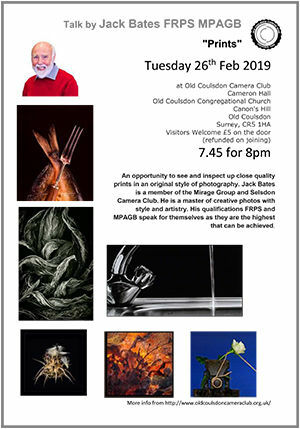 Jack Bates is a member of the Mirage Group and Selsdon Camera Club. He is a master of creative photos with style and artistry. His qualifications FRPS and MPAGB speak for themselves as they are the highest that can be achieved.